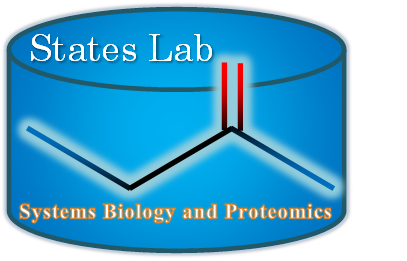 The States Group develops multidisciplinary computational applications for biomedicine. We have focused on high throughput experimental technologies and ways to enhance knowledge acquisition using novel algorithms and strategies for data acquistion. Early work invovled the development of pure absorption phase methods for multi-dimensional NMR spectroscopy, enhanced lane tracking and basecalling algorithms for genome sequencing and more recently improved algorithms for the analysis of proteomics and mass spectrometry. Dr. Angel Lee is a collaborator with research interests in macrophage biology, myelopoiesis, signal transduction and molecular cell biology. The States Group is also engaged in molecular biology data integration. Projects have included physical map assembly, genome annotation, the analysis of gene expression profiles, databases for molecular interactions and automated natural language processing.